When light reaches an object, different things can happen: Light can be absorbed, reflected or transmitted through the object. Generally, a combination of these takes place. Let's see this concept in a graph. If we have red pants, it will absorb green and blue. It will only reflect red and, thus, we see it red. Theoretically, a white object reflects every type of light and a black object absorbs every type of light. In this course, we will not go into specific details of light physics. However, we will see how to apply these light properties or characteristics to our advantage. When light reaches a surface or object, this can absorb all or portions of light. In the graph below, we see how a black object absorbs all light. In the first graph above, we saw how the red pants absorbed green and blue. Light which is absorbed transforms into heat. This is why using dark clothes during summer is not recommended because they absorb the majority of light and transforms it into heat. Thus, we will feel hotter if we wear black clothes than if we wear white clothes (which reflect all light). Reflection happens when light reaches an object and it bounces or is reflected, partially or totally, from this object. Light can be reflected directly or in a diffused manner. 1.direct reflection: it is produced when light is reflected from a flat or smooth surface such as, for example, a mirror. Light will be reflected in the same angle as it reached this surface (law of reflection). 2. diffused reflection: it is produced when light reaches a surface or object which has texture such as, for example, a wall with texture. A diffused reflection will produce a softer light than that produced by direct reflection. It will also generate less contrast in the scene, clearer shades and a smoother transition between highlights and shadows. A direct reflection will produce a more intense light, with higher contrast and darker and well-defined shadows. As we mentioned previously, white reflects (theoretically) every form of light. A coloured surface will reflect its own colour while absorbing the rest. For example, a green object will reflect green and it will absorb red and blue. Transmission happens when light goes through a surface or object. There are 3 types of transmission: direct, diffuse or selective. 1. direct transmission: it is when light goes through an object and no change in direction or quality takes place. For example, through glass or air. 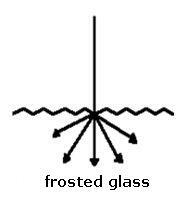 2. diffuse transmission: it is produced when light goes through a transparent or semi-transparent object with texture. For example, frosted glass or drafting paper. Light, instead of going in one direction, is redirected to other directions. Light which is transmitted in a diffused manner tends to be softer; it will have less contrast and less intensity; it will generate clearer shades; and it will have a smoother transition between highlights and shadows than direct light. 3. selective transmission: it is produced when light goes through a coloured object. A portion of light will be absorbed and another portion will be transmitted through this object. 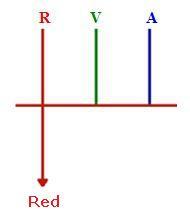 In the example below, white light (red, green and blue) goes through a red surface. The green and blue are absorbed and only red is transmitted. As a result, we will only see red light on the other side of this surface. Filters or gels, which we mentioned in the lesson about colour temperature, work through selective transmission. Colour filters will only allow one colour to go through (a blue filter allows only blue light go through) and it will absorb the rest of the colours. A blue filter lets blue wave lengths through and absorbs red and green wave lengths. We will see some examples on how to use these Light Properties to improve our photographs.